Preparing to redecorate is an exciting time, as you look forward to the new style of your home. Paint is an inexpensive way to make a big difference in any room, and following the proper steps will ensure that the paint applied to the walls matches the color on the swatch. Paint color can be compromised when the original wall color shows through. Yellow walls are challenging, as they have the ability to change blue to green or red to orange as it dries. The best way to tackle painting over yellow walls is to start out with plenty of primer. Paint shades can change when applied directly to yellow walls. Wipe down the walls with a wet cloth and light soap to remove dust and dirt. Primer sticks better to clean walls. Allow the walls to dry. Tape off areas that you do not want to paint. Roll painter's tape slowly and evenly to create a straight border against trim and windows. Lay a drop cloth on the floor under the first section you plan to paint. Push the cloth as close to the wall as possible to protect the floor from paint drips. Line the roller pan with a liner and pour in mixed primer. Coat the roller with primer from the pan. The roller should be saturated, but not dripping. 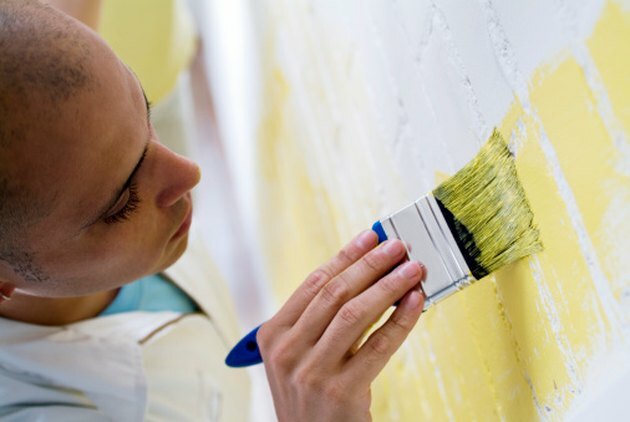 Apply primer evenly to the wall with a fluid, vertical rolling motion, ensuring that every bit of yellow paint is covered. Allow the primer coat to dry for several hours. Discard the remaining poured primer and liner. Line the pan with another liner and pour in mixed paint. Use a fresh roller to paint the wall. Apply one to two coats of paint in your chosen color. Allow to dry for at least 24 hours before removing the painter's tape.